In the Late Neolithic, a new style of pottery appears among the grave goods buried with the dead in many parts of Europe. A new genetic study shows that, with one exception, its dissemination was not accompanied by large-scale migration. At the end of the Neolithic, on the threshold to the Early Bronze Age, around 2600 BCE, a new set of religious beliefs began to spread across Europe. This is indicated in the archaeological record above else by the appearance of a novel form of pottery among the grave goods buried with the dead. These highly characteristic, decorated vessels are known as bell beakers, and their dissemination from Spain as far as Hungary, and across Northwestern Europe into Britain is known as the Bell Beaker phenomenon. 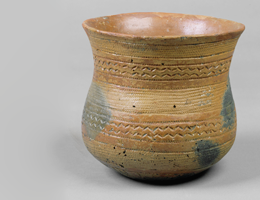 A team made up of geneticists and archaeologists has now explored whether the diffusion of these pots was driven by the influx of new migrants. Their findings appear in the latest issue of the journal Nature. The new study, for the first time, combines archaeological data relating to the distribution and ages of the Bell Beaker phenomenon in Europe with genetic analysis of human DNA sequences obtained from skeletal remains dated to the same period. This approach has enabled the team to compare the spread of the bell beakers (pots) with that of the migrants (people) who brought the new ideology. The results indicate that the diffusion of the pottery in continental Europe was not accompanied by large-scale migration. “The study demonstrates that the spread of cultural elements need not involve migrational movements. In this case, it was the ideas that were propagated,” says Professor Philipp Stockhammer of the Institute for Prehistoric and Protohistoric Archaeology at LMU, one of the leading archaeologists among the authors. The results refute the long accepted theory that the spread of the new religion through Western and Central Europe was associated with significant incursions of migrants. Britain, however, represents a striking exception to this. Here, the appearance of the Bell Beaker phenomenon coincides with genetic evidence for the arrival of large numbers of migrants from continental Europe. In the course of their investigation, the authors obtained DNA sequence data from 400 human skeletons, making it the largest study of ancient DNA carried out so far. This material had been excavated from 136 different sites, most of them in Britain, Spain and Germany. The new DNA samples from Germany originated from excavations carried out in the Valley of the River Lech. In a recent paper based on material from this area, Philipp Stockhammer reported evidence that reveals the surprising mobility of women in the Bronze Age. “We will now have to compare these three regions in order to determine the degree of spatial variability in mobility across the transition from the Neolithic to the Early Bronze Age,” he says. The ability to recover and analyze ancient DNA from human burials on such a large scale was made possible by the advent of new techniques. These advances will usher in “a new era in palaeogenetics,” he adds.